Cleansing Service Group (CSG) has been appointed by SSE Enterprise Contracting, a leading supplier of multi-discipline mechanical and electrical services, to deliver waste equipment maintenance services for schools and other sites owned by Hampshire County Council. SSE Enterprise Contracting currently delivers a range of mechanical and electrical services for the council and has appointed CSG on a one year rolling contract. CSG’s support will include regular servicing of pumping stations, sewage treatment plants, interceptors, septic tanks and storm water holding tanks at 43 sites across the County. The majority of site visits by CSG are being scheduled to take place during the school holidays. 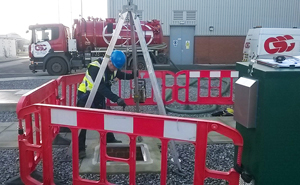 CSG are also providing telemetry installation and servicing, desludging to some sites as well as the analysis of samples from sewage treatment plants to ensure they meet discharge consent requirements. The collected sewage waste will be transported by CSG’s purpose-built vehicles to a specialist treatment and disposal facility. CSG group business development manager Mike Wilson said: “The SSE contract enables us to employ a number of our specialist engineering and maintenance disciplines to provide an efficient and effective service to one of the UK’s major contractors. Our ability to provide a wide range of waste equipment maintenance and related services is proving to be of benefit to many of our customers”. Picture shows CSG operatives carrying out a confined space entry within a sewage treatment plant.